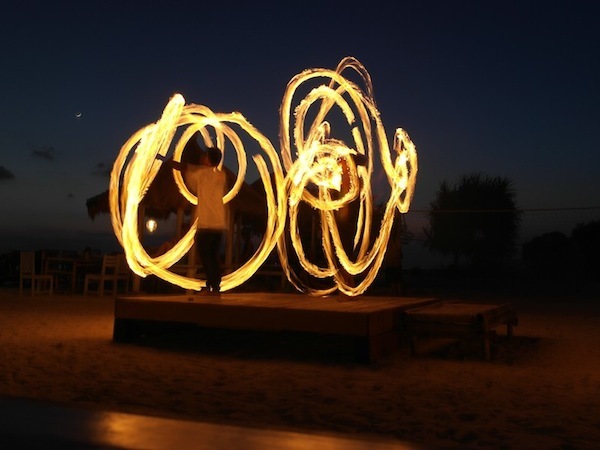 The Gili Trawangan nightlife scene is known for the best beach parties in Asia. Is the party island really the Ibiza of the East? 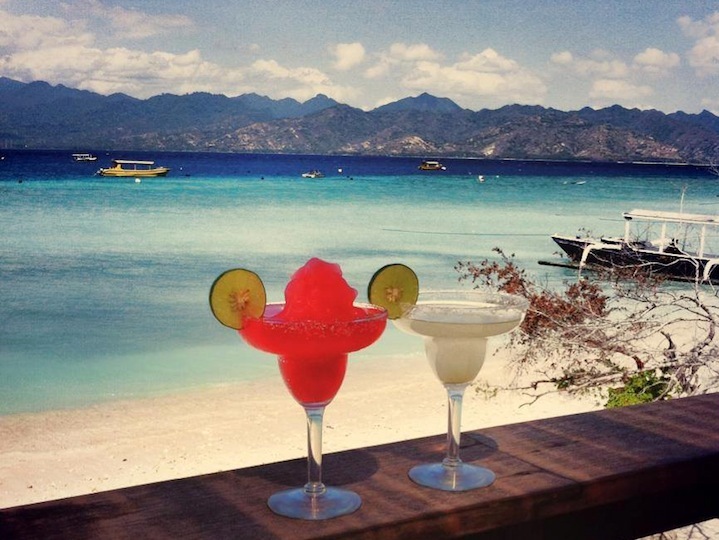 Here’s the lowdown on the beach beach bars, island pubs and parties in Gili Trawangan. You can’t miss Sama Sama Reggae Bar. It’s a huge, double storey bar painted bright yellow that confronts you the minute you come off the boat landing in Gili Trawangan. The premises are surrounded by a cohort of island Rastafaris at all hours of the day, and night. Live music and bright lights attract the crowds to this joint, and it does get well packed out most nights of the week. It’s nice and centrally located and if you plan on having a big night, with cheap drinks and a dance floor that goes off. Rudy’s hosts arguably the best beach parties in Gili Trawangan. The dance floor is always packed out, and it’s the number one spot to socialise. The drink specials are legendary, but watch out for Arak cocktails. Beers are always cold, cheap and safe to drink, so stick to that. The crowds, are a mixture of locals and visitors who are all ready to party. On the other hand, pick a good night for it. At times, the crowds can be a little seedy. Rudy’s is the sort of bar where things could go either way, depending on the night that you’re there, and depending on who else is there.. Keep it on your radar but be prepared to give it a miss and move onto the next place if the vibe isn’t right. 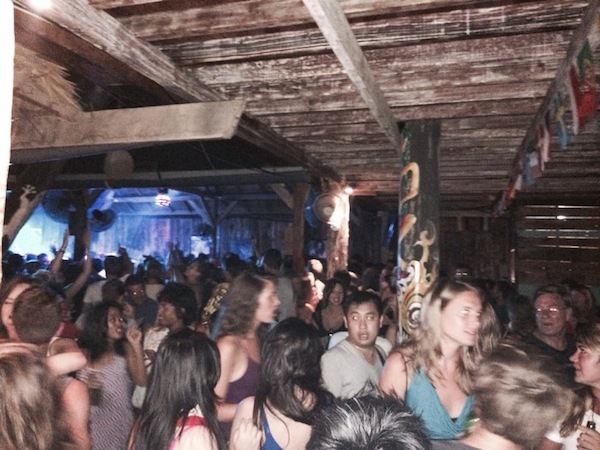 Tir Na Nog is Gili Trawangan’s resident Irish bar, where the disco goes off and full moon parties are themed. So bring your 80s party outfits. The big party nights here are every Wednesday. In the early evening, it’s a great place to have a quiet beer and catch the footie on their large screen TVs. The service here is better than some of the other bars on the island, and the food, which includes a lineup of Mexican and western pub grub is highly rated. You can’t walk around Gili Trawangan and not overhear people talking about Blue Marlin. It seems to be the place where people start, and end the night. But it can get a little over crowded. Well, that’s not a problem, since it’s located slap bang in the middle of Gili Trawangan’s party strip. So options to party hop are endless. Also a plus: visiting DJs equals a better selection of beats than the rest of the bars, and who can resist a tipsy dip in the pool? 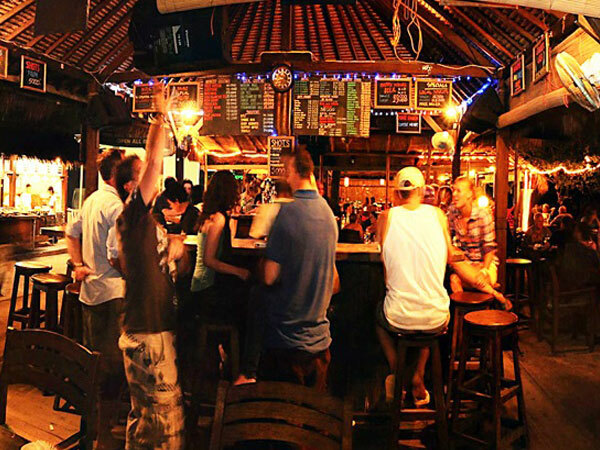 Scallywags is one of the finer establishments in Gili Trawangan on this list. While it’s not a place to go nuts, it’s not a bad spot to warm up the night with quality cocktails and a really good seafood BBQ. Besides, drinking on an empty stomach is a distinct no-no. It’s a beautiful spot, right on the ocean for a hangover brunch and an afternoon tipple for you party animals who start early. Wink. Wink. Paradise Sunset Bar is a leap from Gili Trawangan‘s main party strip. It’s a wonderful spot for travellers who want to enjoy a healthy balance of Gili Trawangan’s nightlife and naturally stunning evenings. Get here at sundown for a few apperatives, perhaps a plate of bang-on roast chicken and then a few more post-dinner drinks over the bonfire and impressive fire shows. Getting back to the main strip is a little bit of a trek (at least 25 minutes), but the horse carts hang around to shuffle party goers around the island. is there any fool moon party in gili island??? i am from india and planning to visit bali-gili. is it worth going for full moon party?? if yes will there be a full moon party on 30 june?? (during ramadin) and where it will be organized?? Did you end up going to Gili during Ramadan? How was it?